This is a Post from the Symbol Surfing Blog from Wed, Aug 29, 2018. This really could be the last chance to get in AMZN below $2,000. Just look at the 1 year chart. This stock doubled in the last 12 months. What about a pullback? Is it overvalued? I don't see the stock taking a break. They are so diversified and dominant as well. Did I just come up with a new phrase? Probably not. Also, with AAPL breaking the $1 Trillion Market Cap barrier, I'm betting AMZN will not be far behind. Symbol Surfing was cited in this article by Jon Swartz at Barrons. What if you don't want to put $1,996.49 into 1 stock? The answer is fractional shares! At this time, Robinhood does not offer this option, but I found another broker who does. With Stockpile, you can buy $200 worth of AMZN which is about 10% of 1 share. If AMZN is at $3,000 in 1 year, your fractional shares of stock will be worth about $300. 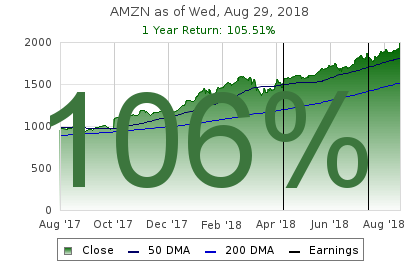 If AMZN is at $1,000 in 1 year, your fractional shares of stock will be worth about $100. I can't think of a good reason to not own at least some amount of this company. I have traded this stock over the years for nice gains but I would have been better off never selling.